‘Israeli’ Attorney General Avichai Mandelblit reportedly approved a full criminal investigation of Zionist Prime Minister Benjamin Netanyahu into allegations of bribery and fraud. Netanyahu will be investigated by police for two separate cases and will be called in for police questioning in the coming days, Channel 10 reported on Wednesday. Earlier on the same day, ‘Israeli’ media reported that the police obtained new documents in a secret probe against Netanyahu, prompting them to seek a full criminal investigation against him. Since discovering the files, police have requested from Attorney General Avichai Mandelblit that he allow a full investigation against Netanyahu. Authorities are reportedly convinced that they will be able to open one in the coming days, Channel 2 News reported, according to The Times of ‘Israel’. 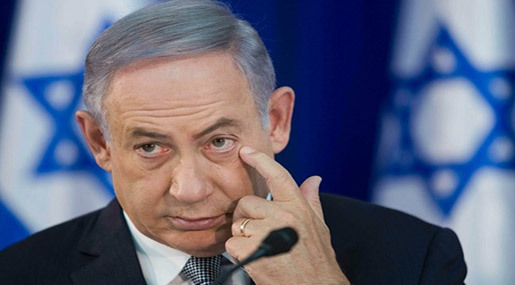 The documents were reportedly obtained as part of a secret inquiry against Netanyahu by special police unit Lahav 433, which was launched in June. The probe was given the green light by Police Chief Roni Alsheich, who demanded secrecy and that no details of the investigation be leaked to the media. Meanwhile, Mandelblit also reportedly instructed employees in the state prosecutor’s office to look into allegations that Netanyahu accepted €1 million [$1.04 million] from Arnaud Mimran, a French businessman currently serving eight years in prison for committing carbon tax fraud. During his trial, Mimran claimed he donated the money to Netanyahu during his 2009 election campaign. It is indeed far from the first time that Netanyahu has come under fire for suspected corruption. Last month, Mandelblit opened a probe into an alleged scandal involving the purchase of German submarines, with Netanyahu’s personal friend and lawyer suspected of a conflict of interest. The prime minister is expected to be questioned in the probe. In July 2015, then-Attorney General Yehuda Weinstein announced a criminal investigation into alleged misconduct at Netanyahu’s residences. Netanyahu’s wife, Sara, has also found herself in the spotlight for corruption, accused of misusing public funds in May. She was also accused of stealing thousands of dollars worth of state funds from bottles returned to local supermarkets last year. قالت وزارة العدل الإسرائيلية اليوم الأحد إن المدعى العام فى إسرائيل أمر بفتح تحقيق فى “أمور” تتصل برئيس الوزراء بنيامين نتنياهو لكن الوزارة لم تحدد ماهية هذه الأمور. جاء هذا البيان بعد أيام من تكهنات وسائل الإعلام الإسرائيلية بشأن وجود شكوك رسمية محتملة فى ارتكاب أخطاء من جانب نتنياهو أو أشخاص مقربين منه. ونفى نتنياهو عبر محاميه ارتكاب أى أخطاء. ويقضى نتنياهو الفترة الرابعة له فى منصب رئيس الوزراء. وقال البيان إن قرار المدعى العام أفيخاى ماندلبليت جاء بعد الحصول على معلومات عن أمور تتعلق ضمن أشياء أخرى برئيس الوزراء، والتى بحثها مع مسئولين كبار فى الشرطة والادعاء. وتابع البيان لابد من التأكيد على أن هذه عملية بحث وتحر ولم يفتح بعد تحقيق جنائى يتعلق برئيس الوزراء. ويمكن أن تكون هذه العملية مرحلة أولية تقود إلى فتح تحقيق جنائي.